Localization is an aspect of intentional business development which is often overlooked by companies. Improper use of social media, US letter size (8.5 X 11") literature, and even color and imagery are often taken directly from American materials used directly in foreign markets. That simply doesn't work. And even proficiency in "Globish" the new international language, isn't going to get you international sales! But of course, good localization starts with good translation. Here's a handy list of 10 considerations for translation. A huge share of the business market is being missed if you are only targeting English speaking audiences. Less than 10% of the world’s population speaks English as their first language, yet if information about a product is in a person’s native language, that person is four times more likely to purchase. Providing well written English copy is the most important first step to insure a quality foreign language translation. 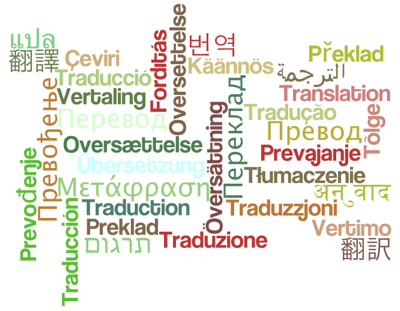 Use a trained and reputable linguist from a qualified translation company. One hospital tried to use a bi-lingual cleaning lady to interpret for a doctor and patient but culturally, the cleaning lady felt uncomfortable questioning the doctor and asking for clarification. Unfortunately, she told the patient that she needed stomach surgery when she only needed a pap smear. Translate for the audience. If using a Caribbean French translator for Canadian documents, it will look sloppy because of the geographic language differences. Using different linguists is like using different writers – everyone has their own style. One may use the word “dinner” and another use the word “supper”. You want consistency. Catchy marketing phrases do not work across cultures and languages. For example “got milk” was translated to “are you lactating?” Try to avoid double meanings – they rarely ever translate. In English, we understand what it means to say “that’s hot” or “that’s cool” but it doesn’t carry the same meaning into other languages. Localizing the document means making it appropriate for the audience in a particular target area. If selling in a particular country, consumers will want to see the right cultural innuendos, currency, jargons, etc. Always have the translated document reviewed and edited. Translation is like writing where the more eyes the better for an important document. Do not use machine translations. Keep track of all changes when editing the original copy to save costs on translation edits. Maybe it's time to take a more focused approach to your international business marketing localization!